Stephen Pile was a journalist for far too long and is the author of The Book of Heroic Failures. He is also the Founder and President of the Not Terribly Good Club of Great Britain and was the Artistic Director of the First International Nether Wallop Arts festival in 1984, which came about by accident. The next week Stephen met his wife, had three children, became a television critic for fourteen years and hasn't been out of the house since, which is why Britain looks so strange and changed. Oddly enough I first read this book in 1967 when I was given it as a 21st birthday present. 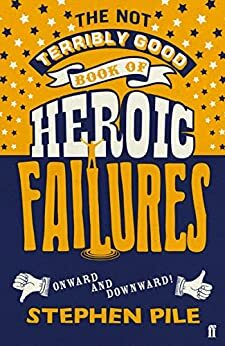 It was interesting to revisit it with technological advance being that I now read it on my smart phone, but it is still a hilariously compiled list of failures... many from the original 1967 version. Fun. Not a deep book, not an introspective book, but a fun book. I suspect some of the included failures are urban legends, but they're strung together amusingly and the book is - again - a fun read. As Mark Davis said in his book Leamon, "Clasics come and go, but a leamon is forever". This book is a compilation of not just those that failed, but failed so spectacularly as to deserve a special book. Hardly comprehensive, this book does try to do justice to the more inventive morons out ther. Hilarious, but like Saturday Night Live, it is best enjoyed in small doses. Also, best enjoyed after consuming two or three adult beverages prior to reading this book (or before watching SNL). 5.0 out of 5 starsA Kindle version!!! Yayyyy! I found this book series when I was fresh out of high school and I have kept them with me as part of my "never to be lost" cherished book friends. I am delighted to be able to add this to my Kindle!! Now I just have to remember how not to laugh so hard I cry on public transport.